Netgear has one of the best Wi-Fi mesh network systems on the market in the Orbi RBK50, and now it’s the only manufacturer to offer a weatherized mesh node that will extend your network deep into your yard. 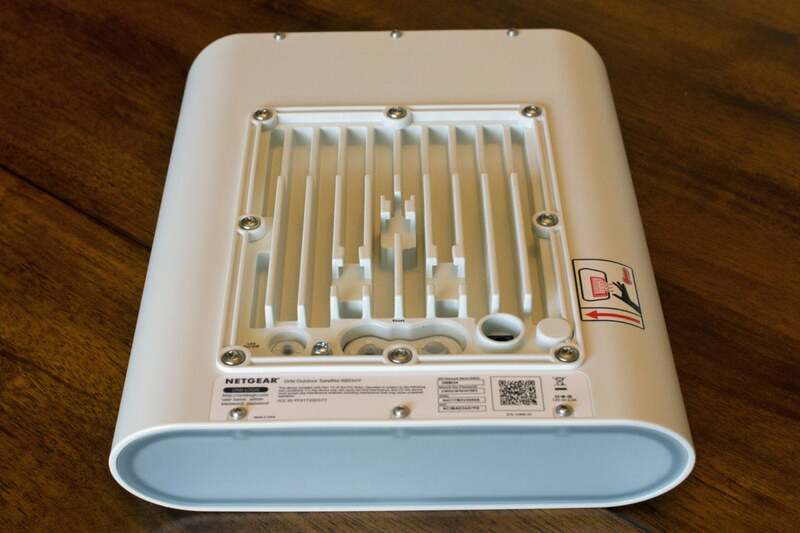 The company says its Orbi Outdoor Satellite (Netgear model number RBS50Y) can add up to 2,500 square feet of Wi-Fi coverage, and I did see significant increases in throughput and range. I tested it with Netgear’s $370 RBK50 kit, which consists of an RBR50 router and one RBS50 indoor satellite. I updated all three devices to the latest firmware prior to benchmarking and recorded a substantial increase in indoor performance as well. I encountered one significant issue, however: After updating the outdoor satellite’s firmware, my client device—an HP Envy x360 with an Intel Dual Band Wireless-AC 7265 Wi-Fi adapter—would connect to the outdoor satellite’s 5GHz radio only if it was within a foot or so of the access point. As soon as I moved the client further away, the client would drop that connection and switch to the AP’s much slower 2.4GHz radio. But that sort of begs the question: If the client is going to attach to the 2.4GHz radio nine times out of 10 anyway, where’s the value in having such an expensive chipset in the Orbi Outdoor? The other problem is that none of mesh networks on the market today are interoperable. While 802.11ac is an IEEE standard, the 802.11ac mesh routers and mesh nodes from Netgear (Orbi), Linksys (Velop), Google (Google Wifi), TP-Link (Deco), Eero, and all the other manufacturers are incompatible with each other. If you want to expand your mesh network, you must use a mesh node from the same manufacturer that built your mesh router. If you want to use Netgear’s Orbi Outdoor Satellite, you can use it only with Netgear’s Orbi-series routers (there are consumer and business models at various price points). The Netgear Orbi Outdoor Satellite can be mounted to a stand, as shown here, or hung on the wall (without the stand). Mounting it higher would likely increase its range. The Orbi Outdoor Satellite is expensive—$329 at Amazon—and it will deliver its highest performance only with Netgear’s top-shelf Orbi routers, which use a dedicated 4x4 radio channel for data backhaul at a theoretical maximum of 1.7Gbps. Those would be the consumer-oriented RBR50 and the business-oriented SRR60. When paired with the SRR60, the outdoor node also supports the business router’s special features: dedicated admin, guest, and employee networks. 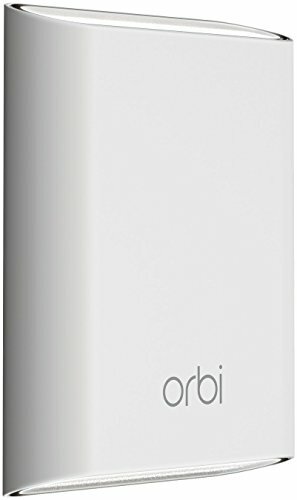 The Orbi Outdoor Satellite must be mounted either to a stand (included) or to a wall, fencepost, or other structure. A white LED on the bottom can provide ambient lighting, but you can schedule on and off times for it or turn it off altogether if you don’t want to draw attention to the unit. Netgear provides a 9.5-foot-long power cord, so you should be able to mount it high on a wall. I couldn’t plug the Orbi Outdoor Satellite’s oversized AC adapter into my weatherproof outdoor outlets. I had to use an extension cord. The end of the cable that connects to the satellite itself has a rubber O-ring to prevent water from seeping in, but I ran into a problem with the oversized AC adapter at the other end of the cable: It wouldn’t fit in any of my weatherproof outdoor outlets, which have either plastic bubbles or spring-loaded doors covering their receptacles. I ended up using a short extension cord and putting the adapter inside a Twist and Seal Cord Dome ($30 at Amazon). 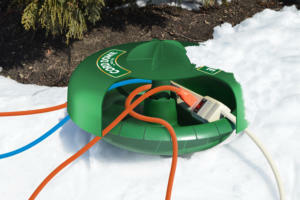 This cutaway shot of the Cord Dome shows how it can protect a powered outlet strip. The Cord Dome is an ingenious weatherproof shelter for protecting power-cord junctions. Measuring 14 inches in diameter, it’s large enough to accommodate a small power strip. While it’s designed to lay flat on the ground (holes and stakes are provided so you can anchor it in place), it can also be oriented vertically and mounted on an exterior wall like a hose rack. 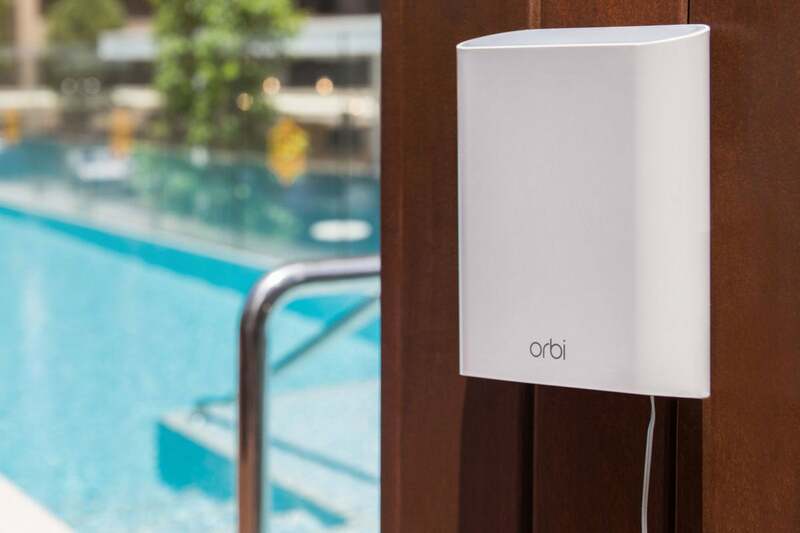 Netgear gives the Orbi Outdoor an IP56 rating, meaning no harmful amount of particulate matter (e.g., dust) can penetrate it, and that it can withstand a powerful water jet from up to a 12.5mm nozzle. Far beyond getting rained or snowed on (it can operate in temperatures ranging from -4 to 122 degrees Fahrenheit), you’ll be able to hose the unit down when it gets dirty. 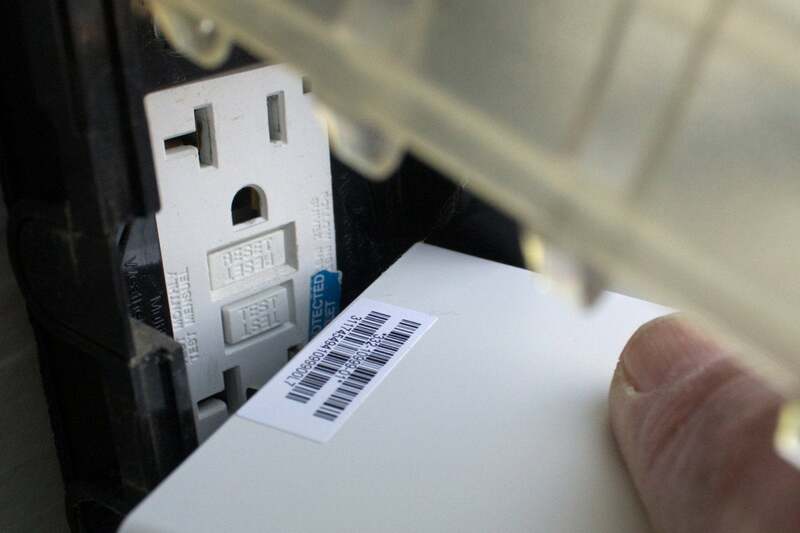 You might want to unplug it and allow it to cool first, however; there’s a large heatsink on the back of the unit with a warning label that touching it can result in a burn. The sudden, radical change in temperature caused by a large amount water coursing over it could have a detrimental impact on the metal. A large heatsink is mounted to the back of the Netgear Orbi Satellite. Installing the Orbi Outdoor was a simple matter of plugging it in and then having the Orbi mobile app discover it, although I had to wait more than a few minutes for that to happen. 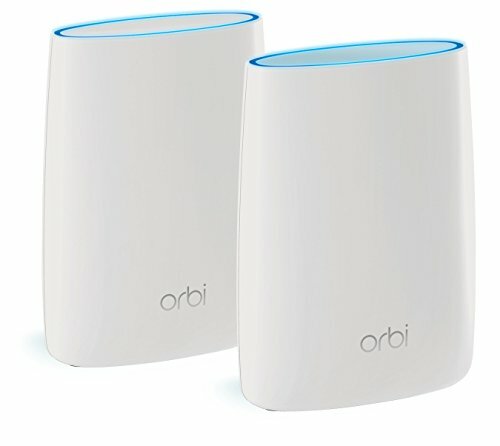 The router and all the mesh nodes use a single network name (you can also set up a separate guest network), so you can move all around your home and the Orbi’s band-steering tech will seamlessly connect you to the strongest access point. As mentioned earlier, I saw a significant jump in performance in my indoor tests after I updated the system to the latest firmware. As you can see from the chart below, when the client was in the same room as the router, separated by nine feet of air, I recorded a 40-percent jump in TCP throughput, from 428Mbps with the older firmware to 599Mbps with the new. Netgear’s Orbi RBK50 was already our top pick in mesh router systems, but a new firmware update increased its indoor performance substantially. When the client was moved to the great room—33 feet from the router, with an insulated interior wall, plywood cabinets, and a refrigerator in the signal’s path—the difference in throughput was even more significant, skyrocketing from 224Mbps to 572Mbps. 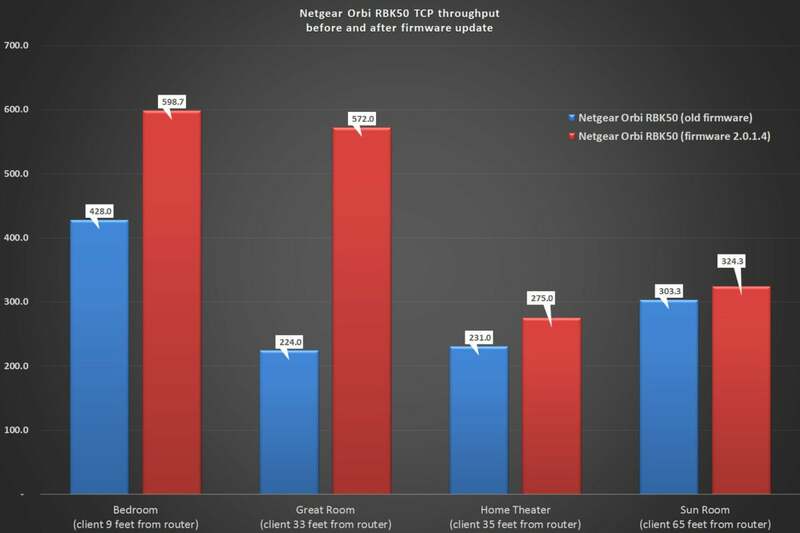 Test results in my two remaining locations weren’t quite as dramatic, but the 19-percent increase when the client was in the home theater, which has double-thick insulated walls for sound-isolation purposes, is noteworthy. 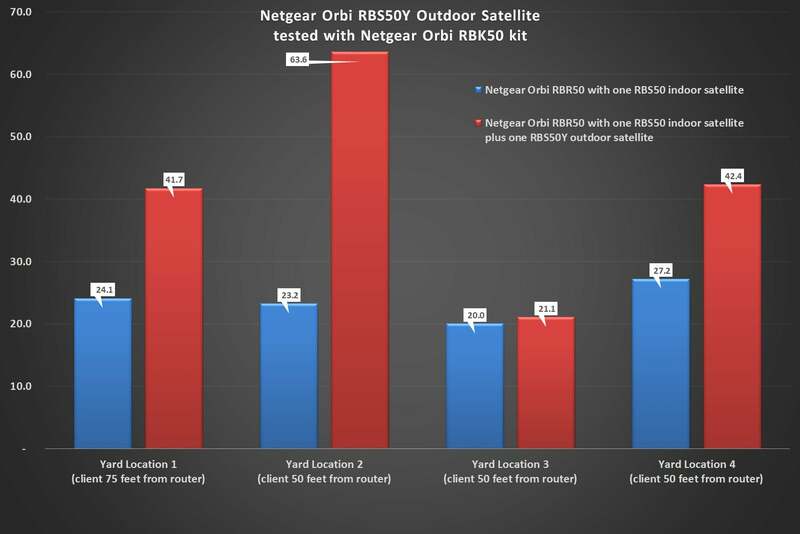 The next chart compares the RBK50 system’s performance before and after the addition of the Orbi Outdoor Satellite. The first thing you’ll notice is that all the numbers are now in only double—not triple—digits. I reset the client’s Wi-Fi adapter before benchmarking at each test location, just to make sure the client was connecting to the access point with the strongest signal, but it’s not possible to force the client to connect to a particular node. The router has an admin page that reveals which node each client device is connected to: It reported that the client in this case connected to the 2.4GHz network in all four outdoor locations, and to the 5GHz network in all four indoor locations. The floorplan shows the number of obstacles between the client and each of the access points, but it’s worth noting that to reach Yard Location 3, Wi-Fi signals encounter a double-wide metal roll-up garage door. 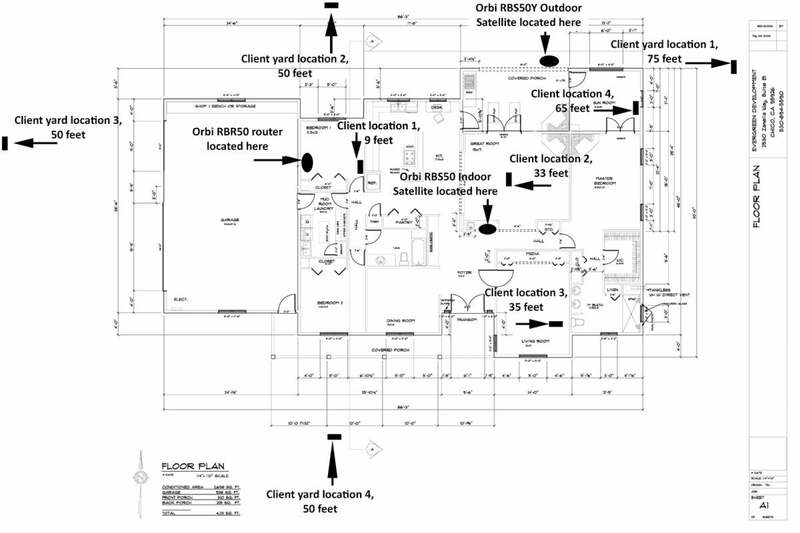 This floorplan shows the four indoor and four outdoor locations the client was placed for benchmarking. Note that the marked locations are not precisely to scale. 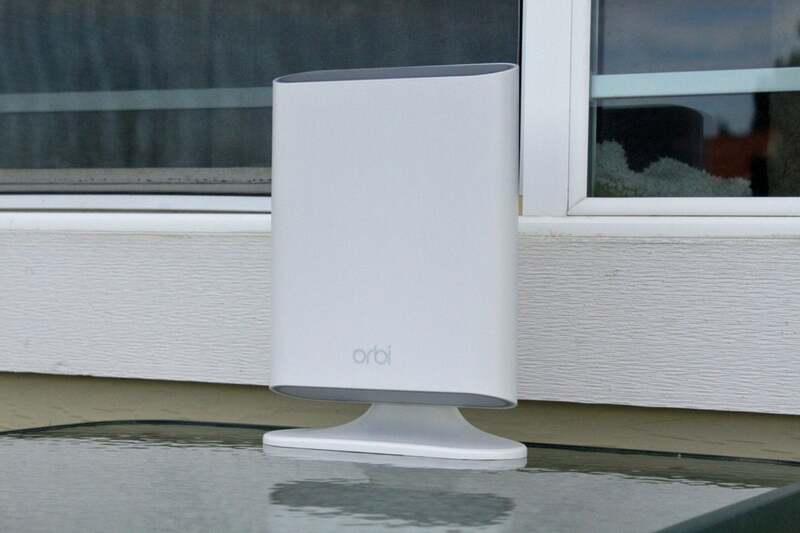 If you’re already running an Orbi mesh network, and you need to extend your network outdoors, the Orbi Outdoor Satellite is an effective, if expensive, way to achieve that objective. If you haven’t invested in a mesh network yet, the Orbi RBK50 is currently our top pick. This product is a lot tougher to recommend if you’ve already invested in some other brand’s mesh network, or if you’d rather use a gaming-oriented router, such as Netgear’s own Nighthawk Pro Gaming XR500 or Linksys’ WRT32XB, because it will require you to toss everything else you have. But if the freedom to stream HD video everywhere in your yard is an imperative, the Orbi system will deliver it. Netgear currently has the only game in town if you want a mesh network with an outdoor node.